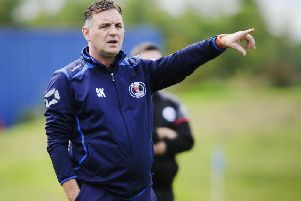 New Bo’ness United gaffer Max Christie dreams of one day leading the club into the promised land of Ladbrokes League Two, writes Craig Goldthorp. Bo’ness left the junior ranks to join the East of Scotland Conference B last summer, with the ultimate goal of working their way up through the pyramid system and playing in Scottish senior football’s fourth tier. And Christie, appointed after Steve Kerrigan’s resignation, said: “In my eyes, Bo’ness is the best supported club in the east at this level. “It was always a job I was going to be interested in if it came up. It is a big club with a big history. “They are a better supported club than some teams playing in Ladbrokes League Two. Ironically, Christie joined Bo’ness after the BUs’ 5-0 January 26 drubbing at a Tranent side he was managing. All five scheduled Conference B games last weekend – including Bo’ness’s match at Bonnyrigg Rose – were postponed due to frozen pitches. Bo’ness are at home to Burntisland Shipyard this Saturday, KO 2.30pm.